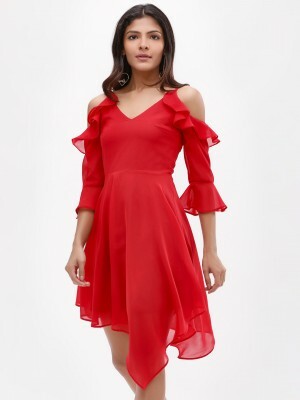 Asymmetric Dress by KOOVSMade from polyester	V-neckline	Cold shoulder style	Zipper fastening at back	Long sleeves with ruffle detail	Asymmetric hem	Regular fit	KOOVS is a women’s wear collection designed by and sold exclusively on KOOVS. Designed in London, Made in India, KOOVS brings you directional and affordable fashion inspired by the catwalk, street style and celebrities. Keep visiting for regular new collections!